New success stories happen every day, as caregivers start using real-time health monitoring in their daily practice. Access to quantitative data on the patient’s sleep, daytime activity and circadian rhythm will open up new opportunities to provide smarter care. At Vivago, we believe that tomorrow’s care is patient-centric and personalised, outcome driven, timely, accessible and cost effective. It includes the patient with their family and friends, and also endorses the clinicians’ job satisfaction. Actigraphy has been widely used in elderly care but it is also promising in other applications. People of all ages may face health issues, where monitoring of daily activity, sleep and circadian rhythm is beneficial. Examples of situations that concern many of us are rehabilitation, insomnia, stress, mental illnesses and painful episodes. The algorithms in Vivago MOVETM learn the user’s typical circadian rhythm and give a notification when it changes remarkably. Actigraphy measures movement, and sudden lack of movement may be an indication of health issues, such as pain or depression. When a person, who usually has an impeccable circadian rhythm starts moving in the night time, this may be an indication of anxiety, insomnia, or nocturnal toilet visits caused by an urinary tract infection. The actigraph alerts clinicians to changes, either subtle or sudden. For a physician, Vivago MOVETM is a tool to access data that would otherwise remain unavailable. Combined to the status evaluation and patient’s own description of events, actigraphy data will assist in diagnostics. As many illnesses and medications have individual effects on sleep and circadian rhythm, actigraphy data may also provide a means of monitoring the effects of medications. Vivago MOVETM is a solution for the whole chain of care. The activity data will follow the patient from home to assisted living, hospital and rehabilitation. It may prove useful when assessing the elderly patient’s functional ability and determining the optimal moment of hospitalization and discharge. Real-time actigraphy data may prove useful in clinical practice. In senior homes, a nurse in a night shift doesn’t have to disturb their sleeping patients, and also morning calls can be started from the patients that wake up earlier. Assisting awake patients to the toilet during the night will help reduce falls, which are a common cause for hip fractures. Outpatients’ status and actigraphy trends are easily accessible to the healthcare professional. This enables timely intervention when a sudden change takes place in the patient’s sleep, daily activity and circadian rhythm. Following these changes may be relevant in many chronic illnesses. When the patient needs assistance, they can trigger a manual alarm by pressing the button on the Vivago MOVETM watch. The watch will also display the user’s location to a remote viewer. Timely home care of the elderly is all about visibility to events that require caregiver’s attention. Actigraphy monitoring may in some cases help detect problems before they escalate and emergency care is needed. The overall paradigm in care is moving from reactive to predictive. Vivago MOVETM is one of the practical tools to enable this. Long-term monitoring is key to recording actigraphy data and detecting changes in the baseline. To enable this, Vivago MOVETM has been designed for comfort, style and ease of use. The watch is water-resistant and can be worn 24/7. Vivago MOVETM is low maintenance, and has a battery lifetime of one month. The only regular care procedure is washing the watch with warm water and mild detergent. Actigraphy data are collected by the watch and stored in cloud with the help of a mobile phone. In situations when the mobile phone does not follow the user, the watch will locally store the activity data. The next time the mobile phone gets to the range, the data will be transferred to the cloud. This helps collect seamless data without interruptions or manual work. The actigraphy data and trends are accessible to the user through a mobile application. Also their medical clinic, family and friends may be granted rights to review the data and receive notifications of changes in the user’s daytime activity, sleep and circadian rhythm. Well managed care processes that concentrate on the essential help manage tight budgets. 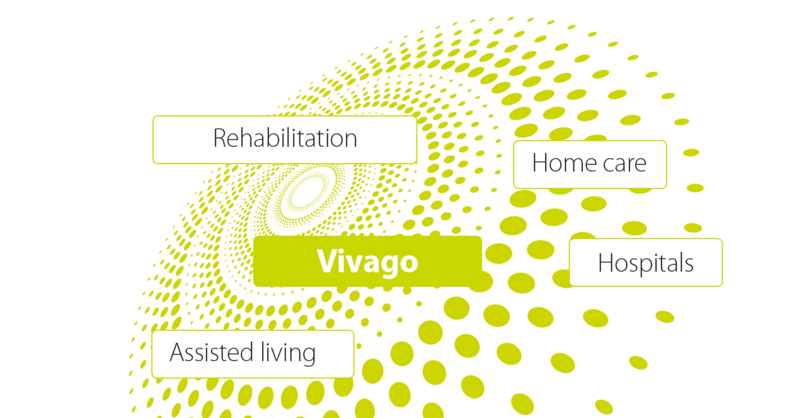 Vivago MOVETM offers opportunities to those aiming at developing home care services and outpatient care of the future. It can also support in rehabilitation and primary healthcare in ways that we cannot even imagine today. Every time a patient’s weakening condition is detected before it escalates, the chances of avoiding sickness leaves, emergency care and hospitalization are increased and money is being saved. Similarly, every senior that can live safely in their own home instead of an institution will not only be happier, but also their care will cost less. A city in the Ylä-Savo region reports that the use of wellbeing information in home care has enabled more seniors to live safely in their own homes. The price for the lowest level of institutional care is about 230€ per day, so postponing it by a year has a price tag of about 83,000€ per patient. Alerting clinicians to problems before they escalate translated itself as 700 avoided ER calls in a time period of 7 months. This is a significant figure, as the city in question has under 100,000 inhabitants. Wellbeing data has been used in the assessment of the patients’ functional capability. Assigning each patient to the right level of care helps avoid admissions from one ward to another. One city reported a 50% reduction in re-admissions annually. A rehabilitation unit in Western Finland has six wards of 30 beds, plus 5 “rehabilitation beds”, whose patients are physically at home with Vivago watches. Not only does this smoothen the transition from hospital to home, but caring for these patients costs over 70% less than treating them inside the hospital walls. A rehabilitation hospital in Helsinki has been able to fasten the rehabilitation process by 60%. This has helped save 1800€ per patient annually. An elderly home in Vantaa took the Vivago system in use in late 2016. Since then, there have been no night-time falls. Zero. 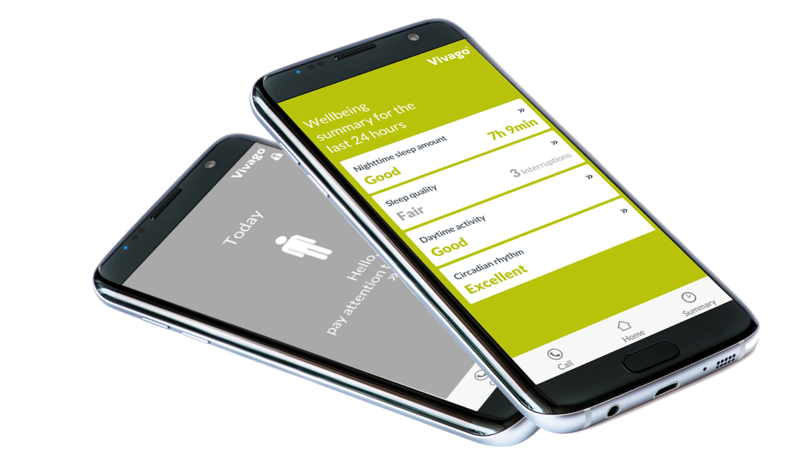 In a care home in Tampere, Vivago’s real-time activity curves are used to guide night-time care, to direct resources where they are needed most. Consequently, one nurse has been removed from night shift to the busy morning shift. This didn’t save direct cost per se, but the staff are now less stressed and more content, because they feel they can do their work better. For the watch user, direct access to information on their daytime activity, sleep and circadian rhythm may serve as a motivational tool and a means of empowerment. The feedback of activity is imminent and clear, and makes the user more conscious of the choices they make. Sharing the user’s wellbeing data with family and relatives may bring sense of safety and peace of mind to all. A child of a home-dwelling senior or a parent of a young adult in assisted living facility will often worry for their family member. Real-time actigraphy data, combined to GPS information, may bring reassurance and provide timely alerts.